No one knows exactly what Menno looked like. 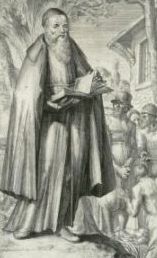 Artists depicted Menno on the basis of descriptions. In a letter from Cleves, dated 19 June 1546, Menno is typified as 'a tall, corpulent man with a black short-trimmed beard'. Jan Neulen from Visschersweert described Menno in 1550 as 'a stout, fat, heavy man, broken or rough of face and a brown beard, could not walk well'. It was widely known that Menno walked with a limp. He himself sometimes signed his writings with 'the lame'. Many of the portraits we know of, present Menno with a crutch. 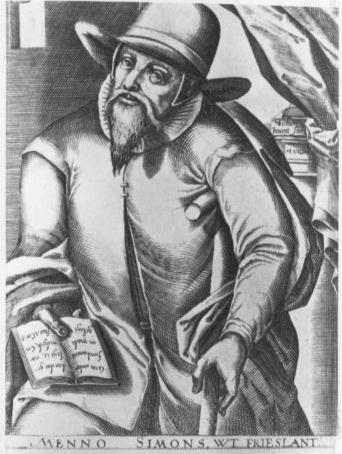 The presence of books and certain gestures typify Menno as an interpreter of scripture. The earliest portrait we know of, made by the well-known portraitist Christoffel van Sighem (right), was created around 1607, i.e. more than 45 years after Menno's death. There has been a lot of discussion about the nature of this portrait. Several historians, such as Irvin B. Horst, have pointed to the fact that Van Sighem was a Roman Catholic and called the portrait "a ridiculous presentation". Apparently these scholars saw in the crutch and the donkey ears of the hat a satirical portrayal of Menno as a physical and spiritual cripple. According to other historians this interpretation cannot stand. Daniel Horst, for example, emphasizes that the crutch was Van Sighems only attribute to Menno's identity. Besides, the supposed donkey ears are probably just the result of Menno's particular pose. In later centuries accuracy of the portrait became a less important factor. The crutch disappeared and Menno was often portrayed standing. We still recognize Menno because of his beard, simple black habit and calotte. Several sites offer collections of images of Menno. Probably the best place to start is the site of the Mennonite Library of the University of Amsterdam. It contains a comprehensive collection of 79 portraits with additional information about the artists.